Red Dawn is the answer to the trivia question, "What was the first movie ever rated PG-13?" For many people, it is also the answer to the subjective question, "What 1980s movie took the decade's Cold War fears in the cheesiest, most outlandish direction?" when students notice a most unusual commotion outside the classroom windows. Against clouds of pink smoke, camouflaged militants parachute down on the school's lawn. These soldiers of unknown origin open fire on a teacher and then the classes themselves, creating a scene of instant chaos. The scene is not altogether unexpected for viewers, especially those who have at all been exposed to this silly 1984 film. The calm-shattering paratroopers have been preceded by a series of fast-moving, grammatically questionable text screens that describe worldwide tumult with buzzwords like "riots", "nuclear weapons", and "revolution." Small, quiet Calumet is, however, plenty surprised to have this sort of thing happen there. Nevertheless, a group of six young males, led by former high school football star Jed Eckert (Patrick Swayze), apparently have a plan of action for such an occurrence. They grab the essentials -- soup, soda, and some rifles -- and head for the mountains. We're led to believe that this group of five teenagers and their self-confident but barely older chief spend a month in a mountain cabin, unnoticed. Covered in some pine branches and bonding over the rookie hunter (C. Thomas Howell) getting to drink the blood of a freshly-killed deer, things seem pretty okay for these completely unwired lads. But supplies run out, dissension arises, and the guys head back home to find that the scene they left has only worsened. It's World War III and it's taking place on American soil. The Calumet drive-in theater has become a reeducation camp of propaganda; some parents are dead, others have had their spirits broken; and the villains have been established as a mix of the armies of Cuba and the Soviet Union. Just when you think Red Dawn's plot is about as far-fetched as it can get, the movie becomes even more of an adolescent boy's fantasy by turning the six young men and a pair of new female additions (Lea Thompson, Jennifer Grey) into capable defenders of America. Led by Jed and his younger brother Matt (Charlie Sheen in his film debut), the gang begins to stand up to the Communist baddies that have taken over parts of the U.S. while most of the world merely watches from afar. They demolish enemy planes, hand-deliver explosive packages, launch missiles at helicopters, turn the tables on firing squads. 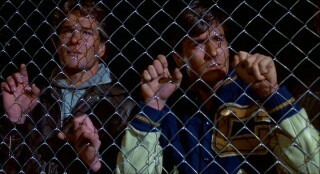 They sign their work "Wolverines", after the name of their high school's sports teams. These young guerillas are the only ones willing to fight back and protect the American way of life. Teamed with a much-needed exposition-spouter, an experienced Air Force colonel (Powers Boothe), this handful of passionate patriots is an apparently greater force than the formidable two armies can handle. In practically every way, Red Dawn is one of the most ludicrous stories ever told. The war tactics and artillery prominently depicted in the film's endless string of combat sequences may very well be accurate; they're admired in such detail that they better be. But the screenplay by Kevin Reynolds and director John Milius is juvenile, viewer-unfriendly, and worsened by the fact it's played with a completely straight face. It's the type of movie which runs less on narrative than on explosions and the makers' strong, timely political beliefs. The personalities are less than one-dimensional; in fact, only in recognizing actors are first-time viewers able to track their characters, which leaves half of the eight "leads" indistinguishable. Not that it matters much anyway, for jingoism is deliberately the only emotion on display and the teens only grow in a gung-ho rebellion sense. The villains, who speak in hyperbole and foreign tongues, can't even merit hate as much as pity for their cartoonish portrayal of their respective nations' America-hating ideals. In spite of Red Dawn's bizzare plot, violence-heavy execution, and many other shortcomings, the movie has made a fairly considerable impression and not just for ushering in the MPAA rating most frequently employed in the mainstream today. By 2007's standards, its $38 million gross may seem rather paltry. But while it paled next to the summer of 1984's biggest blockbusters (Ghostbusters, Indiana Jones and the Temple of Doom, Gremlins, and The Karate Kid), the film still ended up as the 20th highest-grosser of the year, earning more theatrical revenue than some now-well-known productions such as The Terminator and Sixteen Candles. Critics generally didn't like the movie and save for a Young Artist nomination, award ceremonies were uninterested. But it now has the reputation of a cult classic, which is why this week MGM and Fox are issuing a new, 2-disc Collector's Edition of the film. Though perhaps there wasn't an audible clamor for an improved DVD version, this re-release isn't merely an instance of a studio just recycling a recognizable film for the heck of it. It has been 9½ years since Red Dawn debuted on disc. During that time, the film has been paid homage in everything from TV shows like "Scrubs", "South Park", and "My Name is Earl" to PC war games and multiple Grand Theft Auto titles. The most historically significant reference came in December of 2003, when U.S. Armed Forces named Operation Red Dawn and its two objectives (Wolverine 1 and 2) after the movie; the mission would yield the capture of former Iraq president Saddam Hussein. The young careers many of the leading actors would flourish after Red Dawn was released. Patrick Swayze, Charlie Sheen, Lea Thompson, and Jennifer Grey would all go onto star in some of the 1980s' highest-grossing and best-loved films: Back to the Future and sequel, Ferris Bueller's Day Off, Dirty Dancing, Platoon, Wall Street, Major League. Less able to rebound and/or rise was helmer John Milius, whose greatest cinematic achievements remain his pre-Red Dawn contributions to the scripts of Apocalypse Now and Jaws. While the strongly-principled Milius continues to work in the industry, most recently and notably as one of the three creators of HBO's popular historical drama series "Rome", his time in the director's chair has been sparse and, since the mid-'90s, his output has been limited to small films, TV movies, and video games. Story creator and co-screenwriter Kevin Reynolds has received more work behind the camera, though he too has had some bumps in the road, such as the high-profile flop Waterworld. 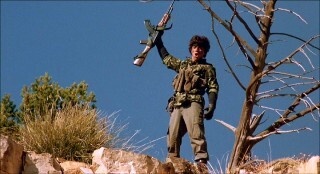 Part of Red Dawn's appeal is its kitsch factor, which easily lumps it together with the Rambo movies, Rocky IV, and other films of the '80s that can be appreciated comedically perhaps more than as seriously intended. Well aware of this going into this quasi-re-viewing, I didn't find much to laugh about; for the shooting, scouting, and grenade-throwing rarely ceases to provide unintentionally humorous moments. One exception is at the film's end, when a dramatic plaque reading is followed, with no transition whatsoever, by a full-sized Patrick Swayze credit and some inappropriately blaring, militaristic score. Too bad there weren't more instances of such inspiration, because I don't care what you think of the movie, the cut to heroically-posed Swayze is hilarious. As on its previous DVD incarnation, Red Dawn is presented in its 1.85:1 theatrical aspect ratio, only this time it is enhanced for 16x9 displays and not accompanied by a fullscreen version of the film. 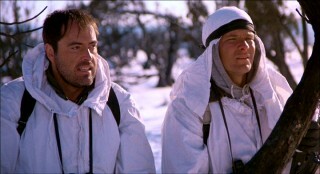 While not flawless or demo-worthy, picture quality is quite good, revealing few signs that this is a 23-year-old film. The feature is anything but visually beautiful, but the presentation here is without any problems more severe than light grain, softness, and some cramped framing, all issues that are unlikely to be new. Without having access to the original DVD, I can only very strongly suspect that this is a vast improvement over the non-anamorphic transfer issued in 1998. The soundtrack is once again limited to two-channel Dolby Stereo. It's pretty surprising that no 5.1 remix is given this action-heavy flick, but faithful to its theatrical presentation, the sound mix here is not too shabby. Volume needs to be cranked up, but once it is, the noises of modern-day warfare are crisp, vivid, resonant, and affecting. Often spoken in muttered tones, dialog isn't always discernible, but thankfully there is a hearing-impaired-friendly English subtitle track. The film's villains speak at length in Spanish and Russian, which is translated in player-generated subtitles. If you've tinkered with the settings to clarify a line, you'll need to restore them to the secondary English subtitle track to follow along with the foreign dialog. The standard extra that is practically guaranteed to appear on Disc 1 of any two-disc set -- an audio commentary -- is nowhere to be found here. The first platter's lone bonus is, however, intended to accompany movie playback. It is "Carnage Counter", a subtitle track that keeps "a running tally of violent acts" so that the viewer "can keep count as the film plays." Recording casualties among Soviets, civilians, and Wolverines as well as explosions, RPG use, and grenades tossed, the colorful track only appears on screen when any of the previous incidents occur. It refreshes repeatedly during the many scenes of widespread bloodshed. There's not much value to the feature, beyond revealing how shallow and violent the proceedings are, but those wanting to actually watch the movie with this activated will be disappointed to find that the plentiful foreign dialogue goes untranslated in this way. The first of four new featurettes, "Red Dawn Rising" (23:00) serves as a pretty decent general retrospective. It boasts the participation of writer-director John Milius and actors Charlie Sheen, Patrick Swayze, Lea Thompson, Powers Boothe, and C. Thomas Howell. In separate interview footage, they share anecdotes about their castmates, the director, the production, favorite scenes and ones that were deleted, the movie's themes, and Milius' political beliefs. For being composed of nothing but talking heads and film clips, the somewhat slight piece has been edited so that practically all comments have value. It should please those looking for cast-oriented reminiscences, which are universally upbeat. "Building the Red Menace" (9:35) deals with the movie's fabrication of Soviet tanks and planes, as Milius and a number of crew members recall challenges and achievements. The piece benefits from some production photos and videos, but its focus is too technical to interest anyone who doesn't care about battle vehicles. "Training for WWIII" (9:45) recounts the boot camp and weaponry training that the cast underwent in preparation for the film. Actor anecdotes are joined by technical advisor comments in this dry piece. A little more interesting, "WWIII Comes to Town" (13:25) covers Red Dawn's relation with Las Vegas, New Mexico, the movie's primary filming location. Residents of the tiny city who served as extras or crew recall the excitement of having so much explosive Hollywood magic happening in their hometown for an extended period of time. We also hear, primarily from Sheen, about the "legitimately haunted" hotel actors stayed in. Disc 2 closes with something other than featurettes: trailers. This last section contains Red Dawn's glorious theatrical trailer (2:15) plus a trio of minute-long promos for other 1980s MGM fare on DVD: now-incomplete The Rocky Anthology, Hoosiers: 2-Disc Collector's Edition, and Spaceballs: Collector's Edition. Another DVD staple, deleted scenes are strangely absent, especially since the trailer shows glimpses of some footage that didn't make it into the final cut and the first featurette refers to at least two other scenes deemed important that were snipped. Like the designers of the fairly bland DVD cover, those making the menus have not been struck by copious amounts of imagination. Disc 1's home screen features Red Dawn, the title (in a large font) and the image it evokes, with clouds and airborne military paraphernalia providing animation. Disc 2 opts for the same excerpts of military score, only this time with some CGI dust and fire providing life against a static brick wall background. The DVD's standard case comes under the requisite cardboard slipcover, which reproduces the cover art below and ... uh ...slips over it. The package gets bonus points not only for including a chapter insert, but making it part of a worthwhile 4-page booklet that talks at length about the movie's production, reception, makers, and cast connections. 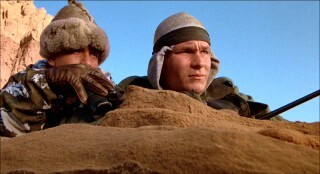 Twenty-three years since theatrical release, the bleak nuclear holocaust flick Red Dawn has as its greatest values Cold War era camp and unknowingly cheesy '80s nostalgia. Though this outrageous action film never merited praise, the years have been especially unkind to it, granting it a dated, outmoded feel that usually takes at least twice as long to surface in cinema of little lasting power. The only viewers likely to truly, sincerely dig the movie are military enthusiasts who can identify weaponry, recognize models of foreign tanks, and appreciate the strategic procedures that occupy much of the film's attentions. But even these people must accept the unlikely premise of high school students as guerilla defenders of America. MGM's Collector's Edition re-release of this cult classic serves up a 16x9-enhanced transfer, which is nice. Its hour of bonus features could easily have fit on a single disc, especially with the old release's fullscreen version dropped. Happily, they catch up with the director and many of the principal cast members, but they're not interesting enough to justify a repurchase for someone who doesn't care about the picture improvements. If you're among those who look back fondly on this film, then this set should suffice as a late first-time buy, but you're apt to be disappointed by the lack of some fairly standard supplements, like known deleted scenes, a commentary, and more production-time material. Text copyright 2007 UltimateDisney.com. Images copyright 1984 MGM and 2007 MGM/Fox Home Entertainment. Unauthorized reproduction prohibited.